Kevin Goldberg, who has contributed a couple of articles to my site, translated Wine Atlas of Germany and added a translator's note at the beginning of the book. 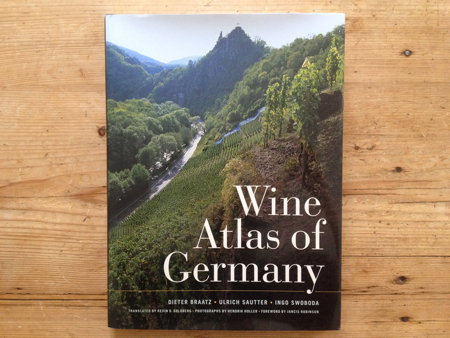 In the note, he highlights that the atlas even covers the overlooked wine regions of the Ahr, Baden, Württemberg, and Taubertal (which is actually not one of Germany's 13 official Anbaugebiete, or growing regions), as well as Saxony and Saale-Unstrut in eastern Germany. He also defines the important terms Einzellage and Grosslage, which were enacted by the German government in 1971. (An Einzellage is an official single vineyard, and a Grosslage is a collective site of single vineyards.) Kevin mentions how the government enlarged most single vineyards, which covered up many former sites. Another issue that is discussed by the authors is the creation of the deceiving category known as Grosslage. Without knowing the names, it's impossible for the average consumer to differentiate between an Einzellage (Piesporter Goldtröpfchen) and a Grosslage (Piesporter Michelsberg). Fortunately, this has become increasingly irrelevant since the only Grosslagen still being employed by quality-conscious growers—most notably Bernkasteler Badstube—are ones that don't abuse site potential or violate communal integrity. In my book review, I'll focus on the Mosel region, but first let's look at the introduction. The atlas ranks the various German vineyards in four quality categories: "exceptional," "superior," "good," and "other," the latter of which means of no special distinction. (On the maps, "excellent vineyard" is used in place of "exceptional vineyard.") Braatz et al. describe the categories and talk about some of the complications involved with ranking the vineyards. "The intention to simplify parcel names triggered the consolidation of individual sites into larger, single-branded vineyards," the authors say. "The law thus enabled winegrowers to rebrand some second-class vineyards with the names of more prestigious and recognizable neighboring vineyards. At the same time, several vineyard names associated with prime parcels (however small) disappeared from use." Because of this, they chose to rank some expanded single vineyards lower down, even if "the vineyard's best wines are 'exceptional.'" They note these examples under the relevant site profiles. As for the 1971 German Wine Law, the authors would like to have it amended in order to use place-names on labels. This would be a step in the right direction, along with abolishing Grosslage. Yet while they generally list as their "excellent vineyards" non-Einzellage parcels if those are the chosen names for the top dry wines, they fail to note such instances where they appear, nor do they always depict them or their boundaries on the maps. For example, a friend pointed out that in the Pfalz region, neither Breumel nor Kammerberg are Einzellagen and Breumel isn't even marked on the map. Likewise, the superior sites of Rädling, Spiess, and Steinbückel are not Einzellagen and are shown on the map, whereas Ganz Horn (a part of Sonnenschein) is not classified, but the less well-known non-Einzellagen above are. Braatz et al. go on to say that their work "on this atlas has underscored for us the merits of impartially classifying all pertinent top-quality vineyard parcels rather than recognizing only the current bloated, oversized [single] vineyards. Only in this way can the character of each site be preserved, allowing us to approach German wine with a view that is cultural and sustainable rather than transient and economically shortsighted." They also give their support to the VDP (Verband Deutscher Prädikatsweingüter) classification system, which has evolved over the years and now resembles the model used in Burgundy, which is based on a four-class hierarchy: Grosse Lage (grand cru, or "great site," a new category not mentioned in the atlas that replaces Erste Lage at the top), Erste Lage (premier cru), Ortswein (village wine), and Gutswein (a basic "estate wine"). For those who don't know, the VDP is an association of leading German wine estates, which has a recognizable logo of a stylized eagle bearing a grape bunch on either its capsule or label. The VDP has decided to go its own way with this classification and many nonmembers are following along. The choice of the name Grosse Lage will present problems, as non-German speakers might confuse it with Grosslage, an aspect not thought through when the VDP created its new designation for grand cru sites. Braatz et al. point out some of the other problems with the VDP scheme and that "the VDP's classifications apply only to its member growers." The authors then claim to "have striven to include sites of non-VDP members as well." This is debatable. What's more, the VDP itself restricts the use of vineyard names on labels, which has forced growers to use various fantasy names. The authors admit, however, that the VDP's classification "has also introduced many problems," which I won't go into here. After the intro, the authors have a chapter titled "What Makes a Vineyard Unique?" and one on "The History of Winegrowing in Germany." Both give respectable overviews, before getting to the different grape varieties, wine regions, vineyard sites, soil types, and, of course, maps. For the most part, the authors are sensible and state that balanced, off-dry German wines with relatively low alcohol are one of a kind and shouldn't be ignored, even if the focus of the VDP is the dry style—that is, the high-end dry wines called Grosses Gewächs (GG). "There is only one 'style' that should raise skepticism, namely wines that follow a marketing idea rather than a wine idea," the authors say. "Designer bottles, special labels, pompous displays and decorations, and self-defined characteristics should be viewed cautiously. These ideas, which could come from cheap business seminars, have little to do with wine and its place of origin." But isn't the VDP following a marketing idea with its classification and with its extra-tall, heavy GG-embossed bottles? The authors also reiterate their "dilemma" of ranking expanded (post-1971) vineyards that have "wines made from less-favorable parts," in which case, they often sided with a lower ranking if the bulk of production comes from the less-esteemed sections, but still does that mean that Ayler Kupp or Dhroner Hofberg is just a "good vineyard"? One quibble: the atlas spells the vineyard names without the suffix "-er" on the village name. In other words, the authors follow the new VDP style of writing, for example, "Ockfen Bockstein" and not "Ockfener Bockstein." Ideally, the VDP prefers "Bockstein," without the village name, for its Grosse Lagen. In this instance, the spelling of Bockstein, without Ockfen, existed before. (But that's not the case for many other famous vineyard sites.) In the 19th century, both Bockstein and Scharzhoberg were considered two of the best sites on the Saar and had no village name attached. The VDP wants to be like Burgundy with its grand crus and list all its Grosse Lagen without village names. This will be a problem for different sites with the same name, like Herrenberg, Kupp, Schlossberg, and Sonnenuhr. But that's another discussion. In the Mosel chapter, the book has different subheadings, including one on climate and soil. One important point that the authors missed in this section are the locks that were built along the Mosel River from 1958 to 1964. This changed the Mosel region and it created a number of warmer microclimates—or, better yet, mesoclimates, as the authors define it—such as in Zeltingen, Enkirch, or St. Aldegund. Under the subheading "Riesling," the authors mention how, in the 1980s, the reputation of "Mosel wine conjured up images of sugared water." This remains an issue today. In "Wine Districts" of the Middle Mosel, the authors describe that the "internationally known Rieslings" of the Bernkastel district come from mostly "blue Devonian slate." Wehlener Sonnenuhr, however, is mostly gray slate. "Rotliegend, a reddish-colored volcanic rock composed of rhyolite and conglomerate that marks the depression around Wittlich, appears here only in the village of Ürzig," the authors say. I believe this is true as regards rhyolite, but other Middle and Lower Mosel sites have what's called Rotliegend from the Wittlich Basin, such as Alfer Hölle. In addition, sections of Ürziger Würzgarten have more than just "red weathered slate." Schweicher Annaberg and a section of Pündericher Marienburg, called Rothenpfad, also have red slate. When I first purchased Weinatlas Deutschland several years ago, I noticed right away a number of errors and omissions, as well as questionable rankings. For instance, Knebel is listed as one of the top-notch growers in Uhlen, but not in Röttgen (which, by the way, should be rated an "excellent vineyard," too). The Knebel family has most of their holdings in Röttgen. The authors curiously don't even list Willi Schaefer, which is a VDP member and one of the best producers in the region (more later on this). In my opinion, the authors fail to recognize many of the Mosel's better vineyards and, at the same time, fully back the VDP classification. For the most part, the historically top sites solely owned by non-VDP members are often ranked lower down or at the bottom. The basis of their work, with few exceptions, seems biased in favor of the VDP, plus the maps could be more detailed. They are only slightly topographical. In a map of the Middle Mosel, Braatz et al. only ranked Batterieberg as a "good vineyard," whereas Zeppwingert, Ellergrub, Gaispfad, and Zollturm are just listed as "other vineyards." In other words, they have no special distinction. Yet these are some of the greatest terroirs in the entire Mosel Valley. The 1897 Prussian cadastral map of the administrative district of Koblenz rates these sites in the highest category. Moreover, most sections of this steep slope have been untouched by Flurbereinigung, a term for the reforming of vineyard land. Hence the terraced sections have old, ungrafted vines. Weiser-Künstler and Immich-Batterieberg (both of which I had the pleasure to represent under the now defunct Mosel Wine Merchant) have their main holdings in this area and are two of the best producers in the region. Yet the authors ignore many other first-class sites along the Mosel River. There's no mention of the exciting Klitzekleine Ring, for instance. This small, jovial group of growers in and around Traben-Trarbach has a side project called Bergrettung—a pun for Alpine “mountain rescue”—to help save old Riesling vines on steep slopes. The authors also fail to talk about the estate of Carl Loewen in Leiwen, which once suggested to the Grosser Ring (VDP – Mosel-Saar-Ruwer) that the first-rate sites of Thörnicher Ritsch or Longuicher Maximiner Herrenberg (which includes a block of old vines from 1896—the oldest parcel of Riesling vines in Germany!) should also be classified among the best sites. Instead, the former head of the Grosser Ring ignored this proposal to include nonmembers' sites. Loewen then patented its own lion emblem to bring more recognition to these vineyards. Here is a list of some of the questionable "other vineyards," which should be ranked higher: Schweicher Annaberg, Wintricher Geierslay (unranked), Kestener Herrenberg, Kestener Paulinsberg, Mülheimer Sonnenlay, Veldenzer Elisenberg, Veldenzer Grafschafter Sonnenberg, Zeltinger Schlossberg, Wolfer Goldgrube, Trarbacher Schlossberg, Trarbacher Ungsberg, Trarbacher Hühnerberg, Trabener Gaispfad, Enkircher Ellergrub, Enkircher Zeppwingert, Enkricher Steffensberg, Enkircher Monteneubel, Reiler Mullay-Hofberg (misspelled on the map), Zeller Petersborn-Kabertchen (among other sites in Zell), Merler Königslay-Terrassen, Alfer Hölle, St. Aldegunder Palmberg-Terrassen, St. Aldegunder Himmelreich, Neefer Frauenberg, Senheimer Vogteiberg, Valwiger Herrenberg, Cochemer Pinnerkreuzberg, Cochemer Brauneberg, Gondorfer Gäns, Winninger Hamm, and Winninger Brückstück, among many others. And here is a list of some important Mosel and Saar producers missing from the authors' list: Jos. Christoffel jr., Alfred Merkelbach, Wwe. Dr. H. Thanisch – Erben Thanisch, Wwe. Dr. H. Thanisch – Erben Müller-Burggraef, Willi Schaefer, Weiser-Künstler, Vollenweider, Immich-Batterieberg, Später-Veit, Weingut O., Clüsserath-Weiler, Kirsten, A.J. Adam, Julian Haart, Carl Loewen, Loch – Weinhof Herrenberg, Günther Steinmetz, Martin Conrad, Lubentiushof, Martin Müllen, VOLS, Melsheimer, Peter Lauer, Falkenstein, and Stein, among others. Getting back to a classification of the Mosel region's vineyards, my grievances about such an enormous undertaking is that it's much more complex than what the authors and other critics make it out to be and it requires more research (old wine books, journals, maps, and price lists), experience, and knowledge of the region and its wines. In fact, three of the leading 19th-century Mosel wine authors—Karl Heinrich Koch, Otto Beck, and Friedrich Wilhelm Koch—didn't feel that a classification of vineyards was feasible for the Mosel. They gave a general ranking but cautioned that all is not first class in the vineyards of Piesport, Brauneberg, Oberemmel, and so on. And, by the way, no wine critic is truly independent or impartial. Each has his or her favorite growers and wines. That's okay. But why do reviewers always highlight this point? Many of the most knowledgeable wine writers work in the trade, like Kermit Lynch or, in the past, Frank Schoonmaker. It's normal, plus they often have more insight. My favorite work about Mosel wine is from the Mainz-based wine broker Karl Heinrich Koch, who wrote a delightful book titled Moselwein, published by von Zabern in 1897. Today, there are other factors that play a role in trying to rank vineyards, such as climate change, vineyard reform/expansion, age of the vines, and so on and so forth. In addition, there are sections of hillsides, such as parts of Piesporter Falkenberg, that are underrated. I will say, however, that it seems odd that so many top Mosel vineyards are unranked, whereas truly lesser vineyards in other regions (Rheinhessen, Pfalz) have Grosse Lage status. It's hard to understand. While there is little doubt, that Bremmer Calmont—along with Winninger Uhlen and Röttgen—is one of the most imposing sites, St. Aldegunder Palmberg-Terrassen is an excellent site as well. On the map from Zell to Bruttig, only Calmont is listed as a "good vineyard." Yet Palmberg-Terrassen suffers less in warm years from a lack of water. Dr. Ulrich Stein, who makes wines from both sites, explained to me that drought-prone vineyards, like Calmont, often lack acidity. I should add, too, that Palmberg has almost exclusively old, ungrafted vines growing in a stony soil of blue and gray slate. It's an impressive terraced vineyard. Yet there are many "other [lesser] vineyards" that can produce outstanding wines. The authors ranked the aforementioned Röttgen lower than Uhlen and failed to rate Brückstück or Hamm higher than "other vineyard." Winningen has a few overlooked sites and not just the terraced parts of Hamm or Brückstück, the latter of which has the choice old-vine section called Sternenberg (or Sternberg). When I worked the harvest in Winningen, I was impressed with other sites, too, like Domgarten, and not necessarily the highly ranked Im Taubesberg on the 1897 Mosel map. The prime Domgarten areas might look less impressive without dry stone walls, but they still have a slate soil and a good exposure. In the Saar chapter, the authors write a very good introduction to the region by describing the land, but the Saar vineyards aren't closer to the Eifel or Hunsrück. In fact, the Eifel is on the other side of the Mosel River, which cuts between both low mountain ranges (see map). As for Saar wines, I don't find them to have more power than Mosel wines. On the contrary, they usually tend to be a little lighter and brighter, with that harder "steely" component. As for the main soil types, the authors list slate and "greywacke," but I'm fairly certain it's a harder gray slate, not Grauwacke. Moreover, diabase is not only found in Saarburger Rausch but also in Krettnacher Altenberg and in Avelsbach (near Trier). They do, however, mention the damming of the Saar River at Biebelhausen, which changed the mesoclimate there. The authors also point out one of the biggest misconceptions with the wines from the Grosslage Wiltinger Scharzberg, which is often confused with the famous (Wiltinger) Scharzhofberg. On the Saar map, the book rates, for example, Ayler Kupp as a "good vineyard," because it's "a heterogeneous site." The best parcels, however, are worthy of classification, they say. But didn't they classify it? Perhaps it would have been better to properly rate the Ayler Kupp slope and then list the actual pre-1971 names of the other slate hillsides, which are different from the original Ayler Kupp but nonetheless are very good sites, too—Schonfels, Saarfeilser, Rauberg, and Scheidterberg. Now that Peter Lauer is a VDP member, the authors might have handled this case differently, much like they did with Clemens Busch and Pündericher Marienburg. I wonder why Saarburger Rausch, which has recently expanded to include Antoniusbrunnen and Bergschlösschen and doesn't have the renown of either Scharzhofberg or Bockstein, is classified as an "exceptional vineyard," whereas so many esteemed Saar sites are merely listed under "other vineyards." Don't get me wrong: I enjoy many of the Rausch wines from Zilliken and Dr. Wagner. But there are plenty of "other vineyards" that have been ignored on the Saar and Mosel. Do the authors now rank Rausch lower because it has expanded to include those two other lower-ranked sites on the same Saarburger hillside? I don't think so. Here is a list of some of the questionable "other vineyards" on the Saar: Ockfener Geisberg (mostly not planted with vines, but considered first-rate), Wawerner Goldberg, Oberemmeler Altenberg, Oberemmeler Agritiusberg, Oberemmeler Rosenberg, Krettnacher Altenberg, Krettnacher Euchariusberg, Niedermenniger Sonnenberg, Niedermenniger Herrenberg, and Falkensteiner Hofberg, among others. $60, University of California Press (2014). Thanks, Lars, for the excellent review. I’ve always been skeptical of the Grosser Ring’s classification of vineyards. Even ignoring the fact that only members’ vineyards are classified, it seems to me that it is a compromise intended to ensure that every member has one or more of the “best” vineyards. To be honest, I didn’t want to bring that point up, but it does seem true with the VDP classification, even though many Grosser Ring producers do have some of the best sites. As I wrote in my article, too few of the historically top-rated sites that have only non-VDP landholders are largely ignored by the authors, with a few notable exceptions rated “excellent” or “superior,” such as Maximin Grünhäuser Abtsberg and Herrenberg. In fact, Abtsberg is the only (non-Grosse Lage) vineyard rated as “excellent” that doesn’t have a VDP landholder. The authors also ranked two sites as “superior” that are not in the VDP classification—namely Grünhäuser Herrenberg and Bruderberg. Though few experts, as mentioned above, would rate the wines of Bruderberg in the same class as Herrenberg. If you’re not confused enough, the Grosser Ring has chosen only to have a three-tier hierarchy—i.e., there is no Erste Lage, only Grosse Lage, plus Ortswein and Gutswein. “The biggest problems are absence of a sound methodology and failure to even attempt an account of what vineyard potential is,” one observer says in regard to the authors’ system of classifying the vineyards. Thanks for your thoughtful review, Lars. Your erudition is something which i admire, and i learn something from just about everything that you write. Although my involvement in the project (which was quite limited, really) may negate my opinion, i don’t know of anything else on the subject which is as thorough or as pleasurable as this Atlas. The photographs are stunning, there is abundant information about familiar and unfamiliar regions, and the large maps are great for quick reference or for us wine geeks who savor nuance and detail. I was most excited about the in-depth coverage of less “international” regions (Baden, Wurttemberg, the Ahr, and Saxony for example) in the original German version. This is still one of the book’s strengths. Any book that attempts to create a hierarchy of taste is inevitably going to encounter resistance. The authors of the Atlas recognize this by 1) acknowledging this challenge, and 2) offering detail about thousands of vineyards no matter where they fall in their hierarchy. Of course, any reader, myself included, may disagree with the authors’ taste. I consider these discrepancies to be indicative of the ever-changing dynamic of viticulture and, more importantly, a healthy, democratic marketplace of consumption. Kevin, I appreciate your kind words and I admire your translation of the atlas. It’s quite impressive. You’re right. The photographer deserves credit, and the authors went well beyond the Rhineland to cover the other regions. It’s true, too, that there will always be disagreements when it comes to classifying vineyards or producers. And the authors do acknowledge some of the issues with the VDP classification, but then why didn’t they challenge it a little more? That’s a good question…but i am unfortunately not privy to how the authors went about making decisions. I don’t see aligning oneself with the VDP as any less right or wrong than not aligning with the VDP. In this case, as you indicate, the authors of the Atlas seem to fall more in line than out of line, but i hardly see this as dogmatic or even as all that controversial. To me, there’s a difference from “aligning oneself with the VDP” and putting blinders on. In the entire Mosel region, they listed just one non-VDP landholder’s site as “exceptional.” In other regions, it’s problematic as well. But I haven’t studied these. The other issue, which I discussed with a friend, is how many VDP growers highlight certain sites as their quasi-Grosse Lage (for producing GGs), even though other sites might be just as good but aren’t emphasized. The authors should take notice of these instances, too. “We are certain that there are few undiscovered pearls in German viticulture, but we are equally certain that some indeed exist,” the authors say. In general, I like the authors’ tone, but this is a big statement to make for their vineyard classification. I’d like to second Lars’ comments commending Kevin’s translation work. The tone is perfect and the book reads easily and well. I appreciate the details provided for each vineyard that is profiled, the photographs are really excellent and the maps are very good. I also appreciate the attention given to the entirety of Germany; this is the most complete and important book published on German wine, in English, since Stephen Brook’s Wines of Germany. I also find the coverage of the Mosel lacking, but largely because I don’t think the region gets the respect it deserves in its native country. Stefan Steinmetz of Weingut Günther Steinmetz recently pointed out an article about the new generation of talented, up-and-coming winegrowers on the Mosel that begins with the lede “Im Ausland gefeiert, in Deutschland belächelt.” or “Celebrated abroad, ridiculed in Germany.” Leaving aside the fact that the article appears in what is basically a step above the German equivalent of the New York Post, the sentiment rings true and I couldn’t help being reminded of it when perusing through my new copy of the Wine Atlas of Germany. As Lars pointed out in “A Get-Together of ‘Mosel Oxen,’” the Mosel Valley is generally viewed as a cheap-vacation destination by the rest of Germany and it’s thought of as a region characterized by the production of out-of-fashion sweet wines for people with poor or no taste. The Mosel’s long and storied viticultural history and its ability to excel at making virtually every style of Riesling are practically ignored and the steep slate slopes are seen as merely a scenic backdrop for foreign and elderly tourists with no real interest in wine. Like Lars, I also realized that one of the Mosel’s greatest estates, Willi Schaefer, wasn’t listed anywhere in the book. The 57.6-hectare Graacher Himmelreich was classified as an “exceptional vineyard” and the 17.8-hectare Domprobst was classified just below it, without mentioning the Schaefer name. Every German wine lover I’ve met knows that the Schaefer wines from Himmelreich can be great, but the fireworks really start to go off in Domprobst. An argument can be made that leaving out one producer is either no big deal or simply a matter of taste, but this a rather glaring omission and calls into question how reliable a source this atlas is for regions I know less about, such as Franken or Württemberg. A quick glance at the atlas’ map of the famous Zeltingen-Bernkastel slope (page 51) and the various classified sites shows that they appear to have been ranked completely arbitrarily, with no thought given to exposure, drainage, altitude, steepness or any other factors. For example, Himmelreich surrounds Domprobst and is more varied in the attributes just listed. Is the ranking arbitrary, or does it have to do with who holds property in a given site? Assuming the latter probably holds some truth, the listing of “most important producers” is generally quite surprising and reminds me of what one would find in a German wine book published some time in the late 80s or early 90s, not 20 years later. In fact, the list of celebrated or “most important producers” looked so familiar that I had to pull out my copy of Diel and Payne’s German Wine Guide from Gault Millau, the 1998 edition that amusingly has been since published as a catch-all reference to German wine. Of the 21 4- and 5-grape Mosel producers listed in this guide, the only two not listed in the new atlas are the retired Hans Leo Christoffel of J.J. Christoffel-Erben (now run by Robert Eymael of Mönchhof) and, oddly, Willi Schaefer. It’s too bad that the authors didn’t seem to make more of an effort to learn about the historic terroirs of the region and ask more questions. What about sites that have historic pedigree but are currently lacking a driven, quality-oriented producer? Oberemmeler Raul, Trierer Thiergarten and Ockfener Geisberg were all highly celebrated 100 years ago and are largely forgotten today. What about areas where there are talented young growers, like the Starkenburger Hang, between Enkirch and Traben-Trarbach, Günther Steinmetz’ parcels in Veldenz and the remarkable vineyards that Ulli Stein works in Alf and St. Aldegund in the lower part of the Mosel or Andreas Barth’s steep vineyards in Gondorf? These are seriously good sites tended by passionate winegrowers, yet almost all are classified as “other vineyards”; do these growers need to join the VDP for their work to be acknowledged? Also, it bears noting that the authors list Clemens Busch as the most important grower in the Pündericher Marienburg (indisputably true), but then characterize the wines from this site as “Light, fruity wines with mineral nuances,” a description that is completely at odds with what one expects from Busch. It’s just another example of the authors not doing their homework for this most important and exciting region. Well, “in Deutschland belächelt,” still seems to apply, but let’s hope attitudes begin to shift in the coming years. Finally, it’s difficult for me to comment on the other sections of the book outside of the Mosel, Saar and Ruwer, since I’ve studied them far less. I know next to nothing about Franken, for instance, and found the chapter quite informative. I know a little more about Württemberg, or at least enough to be unsurprised and dismayed at the authors’ subtle dismissal of the Trollinger grape, even while admitting that the grape “has a certain charm” and can “exhibit its terroir,” qualities that, in my opinion, ought to be celebrated rather than mentioned in spite of the fact that Trollinger will never be a “complex, age-worthy wine.” Certainly there’s no point in nitpicking differing views about what makes for a great wine, I’m just glad that in her recent book, titled Jura Wine, Wink Lorch wasn’t nearly as dismissive of that region’s stalwart red grape variety for highly drinkable, lightweight wine, Poulsard. Hey, John, thanks so much for your long comment. You bring up some great points. It’s true; the Mosel still has a kitsch image among many Germans. I’m glad you pointed out the small number of “exceptional/excellent vineyards” on the Mosel. This can’t be true. How can the Nahe (which truly has great sites) have 21 exceptional vineyards, and the Mosel, Saar, and Ruwer only 13? Rheinhessen has 10 (for crying out loud!). That’s crazy. Likewise, I don’t know how the authors could omit Willi Schaefer. They do mention about being reluctant to rank a potentially great site higher if it lacks a top producer. I couldn’t agree more about showing our support for delicous, light-bodied, quaffing wines that are vinified traditonally and have a sense of place. At the moment, I’m writing a draft for a second article—to subscribers only—that lists some of these other Mosel sites and growers in a little more detail. Yesterday, David Schildknecht forwarded me a press release from the VDP about the new wine-labeling regulations in Rhineland-Palatinate, which would also enable the registration of pre-1971 sites that are listed on cadastral maps. See my article titled “New Wine-Labeling Regulations in Rhineland-Palatinate” for more details. Does the book cover Obermosel at all ? Yes, there’s a map and brief summary of the Upper Mosel. Thank you for the comprehensive review. I just read about the Atlas last week, and am still probably going to buy a copy, but you have many well-taken points here. First and foremost, I completely agree that the excessive focus on VDP producers undermines the purpose of the book. I am certainly not opposed to the VDP or the Grosser Ring, but will echo Eric Steinberg’s comment about the Grosser Ring making sure that every member has at least one site designated as Grosse Lage. The VDP talks about wanting to emulate Burgundy, but the INAO is extremely conservative about what sites get designated as Grands Crus. Thanks for the info about the expansion of Saarburger Rausch. I’m now curious when exactly this happened, and what, if any role, Hanno and/or Dorothee Zilliken had in the absorption of the two lesser Saarburg sites into the Rausch. I was not aware before that there was a Mühlheimer Elisenberg, but you’re definitely right on this – presumably, this is an extension of Veldenzer Elisenberg of Max. Ferd. Richter fame? Last but not least, I am very much with you about these so-called lesser sites. The authors’ statement “that the vintners who cultivate these parcels put forth little effort or that the wines produced offer no value”, is demeaning to the winemakers and cellarmasters who are putting as much effort and investment as possible into their wines from such sites. As I’m writing this, I’m enjoying an 1993 Brauneberger Mandelgarten Eiswein from Willi Haag – without reading the book, I imagine that Mandelgraben is one of the so-called “other” vineyards. It’s a very enjoyable wine, even if it’s not quite at the level of the 1993 Eiswein that I had last year from Selbach-Oster (Zeltinger Himmelreich). To imply that a wine like this offers no value is patently ridiculous. You’re welcome, Andrew. And you should buy the atlas. The expansion of Saarburger Rausch occured in 2012. Hanno and Dorothee Zilliken were for this measure, as all the sites are on the same slope of Saarburger Berg. It’s no different from Ayler Kupp—i.e., the vineyards on the one large, steep hillside, which includes the sites of Herrenberg and Neu(en)berg, plus old place-names such as Wald at the tail end of the slope. If you look on a map, both the Saarburger Berg and the Ayler Berg are on the left bank of the Saar. Each has a south-facing slope in a side valley. The vineyard slope in Wawern is similar. I meant Veldenzer Elisenberg. Thanks for the correction. I’ve edited my text. Yes, the authors made a foolish statement. I’m sure that they didn’t mean it that way, at least I hope so. Brauneberger Mandelgraben is rated as an “other vineyard.” Günther Steinmetz has some good parcels, with slate soil, in the original Mandelgraben. Other parts are less good for producing fine wine. Lars: Thanks for providing the details on the Rausch expansion. It doesn’t seem like Zilliken had bottled anything under these other names in years – I’ve actually had a couple of 1976s from Bergschlößchen, but have never seen anything else labeled with either site. My guess had been that these grapes were being used in the Butterfly these days. If I’m not mistaken, Antoniusbrunnen and Bergschlösschen didn’t exist as vineyard sites before 1971. There were many old place-names, including Rausch, on the Saarburger Berg, but not Antoniusbrunnen and Bergschlösschen. Anyhow, I don’t know enough about Zilliken’s older wines to answer your question. You’re probably right, however. Most of the grapes go into either Butterfly or in one of the Ortsweine, though now they can bottle the wines from these two sites as Rausch. Hi Lars: My copy of the Atlas finally came today, and I had a chance to read over what I assume to be the controversial passage about vintners who make wine from supposedly inferior sites. If this is the passage that you referred to in your review, I’m relieved that at least the authors acknowledge that wines from the “other” vineyards can still be enjoyable and/or interesting. Nonetheless, there is still the implication that any wines from these “other” vineyards cannot be great wines, and we know that this is certainly not true. Obviously, I intend to spend more time with this book in the coming days. One item that already jumped out to me was that Brauneberger Juffer is categorized as an “exceptional” vineyard, ahead of the renowned Bernkasteler Doctor, which only made it into the “superior” group of vineyards. Andrew, I appreciate your pointing out the “not” in this passage. I read it too quickly and need to put a strikethrough on that previous comment of mine. As for Brauneberger Juffer (and Juffer Sonnenuhr), the wines from Brauneberg are arguably more famous than those from Bernkasteler Doctor. In the early 19th century, the French classified Dusemond (Brauenberg) alone at the top in the Mosel region. The wines from the “brown hill” had such renown that the town of Dusemond was renamed Brauneberg in 1925. Nevertheless, I believe the Bernkasteler Doctor vineyard is the highest priced nowadays. In Kevin Goldberg’s “Human-Nature on the Middle Mosel,” he talks about the rise in prestige and price of the Doctor vineyard in the early 20th century. But David Schildknecht adds in a comment below Kevin’s article that Bernkasteler Doctor was already well known in the early 19th century. Thanks for the info Lars. I do recall, of course, your article on the “brown hill”. No surprise to see Juffer-Sonnenuhr ranked in the top group of vineyards – it’s quite deserved. As for the Juffer itself, I’ve just never seen it receive the same level of acclaim as the Juffer-Sonnenuhr anywhere else in present times. With regard to the Doctor, I was similarly surprised that Erbacher Marcobrunn was only rated “Superior”, rather than “Exceptional”. As a new reader, I thank Jean Fisch for his high recommendation of this site. I also purchased the Atlas when it came out and have had reservations about what it contains. First, and most important, the cartography. The Johnson/Robinson atlases had actual equal-altitude lines on their maps, but this one has a far (to me) less attractive system of a color shadings to ‘suggest’ contours. This in my mind makes the current atlas’s maps definitely inferior in style. The elimination of the ‘shadings’ also allows a much better color scheme and the maps are noticeably easier on the eye. Even if revisions of the earlier maps are not available, say, for copyright reasons, I’d strongly suggest a revision of these methods in the direction indicated be considered. One of the problems in classification is in the inclusion of the purpose for which the vineyards are used as a parameter. Many fine Eisweine are, we note, grown in lesser known or less-quality vineyards simply because the topographic influences needed for Eiswein making differ from making other Prädikatswein to some extent (for example, the ability for shallow frosts to ‘roll off’ the vineyard. Certainly there are other differences in purpose which can be noted–for example, making of classic Kabinettwweine, dry wines versus sweet, botrytis-influenced versus overripe dessert wines. While all these, and other, uses cannot practically always be taken into account, they need to be kept in mind when evaluating the scheme. In addition, it’s the quality potential of the vineyard and not the vineyard as planted and producing that must be classified. Carl von Schubert makes this point when he claims that his Bruderberg has been neglected, not least by him, for fine wine production, because the clone planted, the plantation pattern, and the condition of the vines, all were up to recently uniformly poor. It’s easy to note an improvement in the products of this vineyard since replanting has begun and better vineyard methods become possible. My impression of the relative quality of these three vineyards has been changing of late, and are closer together in quality, if not style. It’s also interesting to see that across the valley at the Karthauserhof, the five Enzellagen have been folded into one, but with the awkward problem that not all the surface is of equal quality. Is this not going in the wrong direction? Shouldn’t there be at least two Einzellagen on this alleinbesitz property reflecting this difference? Another problem is, of course, the abuse of the Amtliche Prüfungsnummer, capsule style, or iconic widgets like stars and so forth by using them as a means of hiding quality from the retail customer or at least making it easy for the consumer to confuse the worse for the better? This borderline dishonesty does the industry’s reputation no favors. Have any ideas for making the quality of wines with almost identical labels more obvious? Some nonviticultural anthropogenic changes are horrendous, and perfect, examples of the disrespect German officials have for this cultural resource. That being said, why are these vineyards not listed as UNESCO world cultural resources, to make fighting destructive boondoggles such as the Mosel High Bridge at Zeltingen at least possible, over the supercilious regard of the German government for these irreplaceable assets? Hasn’t this been done in other countries in Europe? 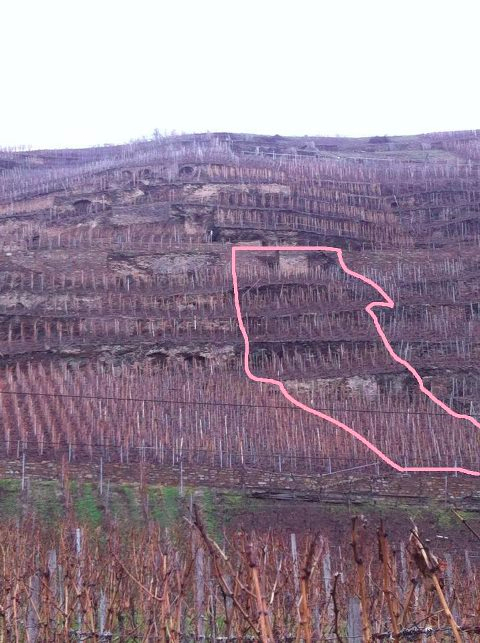 Also, the effect of detritus from activity on the Vulcaneifel in vineyards such as the Uerziger Würzgarten is often overlooked, as is the importance of the geologic ‘seasoning’ of these slate vineyards by substances other than slate. Best wishes for your efforts here, and thanks for your patience. John, I’m glad to hear that Jean Fisch recommended my site. And thanks for subscribing. We agree that the maps in Pigott and Johnson’s atlas are better. Yes, that’s true. An area for making Eiswein is usually a cooler section of a vineyard. As you say, some vineyards are better for producing a Kabinett, others for making an Auslese. Which should be rated higher? As for Maximin Grünhäuser Bruderberg, I agree that this site is a little underrated (though overrated by Braatz et al.). It’s the small east-facing slope, adjacent to Abtsberg. The site now has sufficient ripeness with climate change. In my profile of Karthäuserhof, I talk about the named sites—Burgberg, Sang, Kronenberg, Ortsberg, and Stirn—and why Christoph Tyrell chose to go back to labeling the wines just Karthäuserhofberg. I don’t believe any of the top producers purposely try to trick consumers with AP numbers, stars, and the like. There’s no doubt that more should be done to protect Germany’s vineyards. But this issue goes beyond the German government and the High Mosel Bridge. As Roman Niewodniczanski of Van Volxem pointed out yesterday, so many of the old documents, books, and maps about German wine were not only destroyed by bombs during the Second World War but also discarded later on. He feels many of his fellow citizens lack culture. Max von Kunow of von Hövel has, for example, an old photo of an auction at the Katholisches Vereinshaus Treveris, which was later demolished, much like the Hotel Porta Nigra in Trier. Max said that city officials wanted to make the city modern and had little regard for these old buildings. Though the destruction of cultural landmarks and important historical documents happens all over the globe, and not just from war. Yes, the Ürziger Würzgarten has, among other soil types, the reddish volcanic stone called rhyolite from the Vulkaneifel. It’s also true that slate soils in the Mosel region can have other stones, like quartzite and diabus. In many vineyards, one finds quartz crystals (Bergkristall). 1. The maps of the Mosel, Saar, and Ruwer are well designed and easy to read. Definitely an improvement over the other books that I own. 2. Notably, the Atlas provides quite an extensive look at Baden – very impressively done. 3. Perhaps I’ll never get to try any wine from the Taubertal, but it still was quite fascinating to read about this under-the-radar region and its native Tauberschwarz grape. Despite some flaws and classification issues, I definitely recommend this book. As I said before, I prefer the maps in Pigott and Johnson’s atlas. Yet, as Kevin also pointed out, Braatz et al. cover the other regions in detail, including Baden and Taubertal. It’s hard to believe that Zeltinger Sonnenuhr isn’t rated in the top category.